When it comes to food combinations, it's hard to find a duo more delicious than peanut butter and chocolate. Check out our new PB&C recipes... YAY!!! The name says it all. 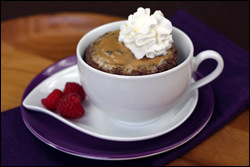 It's peanut butter 'n chocolate cake -- in a MUG!!! Place chocolate chips in a microwave-safe mug sprayed with nonstick spray. Add 2 tablespoons hot water. Microwave for 20 seconds, and stir to dissolve. If needed, microwave for an additional 10 - 20 seconds, and stir until fully dissolved. Add 1 tsp. peanut butter and all remaining ingredients except Reddi-wip. Mix well. Microwave for 1 minute and 45 seconds, or until set. Gently spread cake with remaining 1 tsp. peanut butter. Top with Reddi-wip and eat up! Want your dessert cool, creamy, 'n crunchy? We've got you covered. 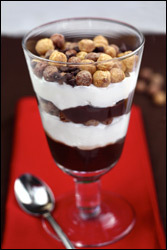 In a mid-sized glass, layer half of the following ingredients: pudding, Cool Whip, and cereal. Repeat layering with remaining pudding, Cool Whip, and cereal. Sprinkle with chocolate chips, grab a spoon, and dig in! 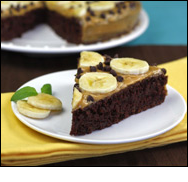 The King of Choc'-n-Roll Cake - We can't help falling in love with this cake -- try it and you'll understand. Dreamy Chocolate Peanut Butter Fudge - Our fudge is rich and gooey, and it has just four ingredients... Click to see what they are! Nutty-Good PB Brownies - If you prefer brownies to fudge, no worries. We have brownies with peanut butter swirled on top! Teeny Weeny Creamy Oreo Peanut Butter Poppers - Crunchy li'l bites of sweet, desserty goodness -- make them now! PB 'n Chocolate Bread Pudding - How do you make something like bread pudding even MORE decadent and comforting? Add today's star ingredients. You MUST pass around this email. After all, the new recipes are for single-serving desserts, so you won't wanna share yours. Click "Send to a Friend" STAT! Today is May 3rd, National Chocolate Custard Day. We'll be skipping the real deal and eating something packed with chocolate pudding instead... like today's parfait recipe!